top secret | Go Mommy! So when you saw the title of this post, did you really think I was going to post my “Before” photos here in all of my XL glory? Seriously? HA HA HA HA No. 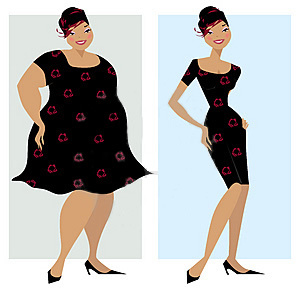 Now please, before you go reading anything into this cartoon, please know I just snagged it from google images (credit given) because the lady still looked cute, even for a big girl. Kinda like me. So I appreciate her struggles, even though she is, well, a cartoon. The thing is, I DID just take some super-duper-top-secret “BEFORE” photos. I’m getting ready to start something new this Monday and I’m certain that the last quarter of 2010 is going to yield awesome results for me physically! The Before Photos will be my evidence of how far I’ve come. But I am most certainly NOT going to be sharing those “Before” Pics here unless I’ve got some hottie “After” Pics of myself to post along side them. This will take time, effort, and cooperation from my metabolism. If you want to know why most people don’t embark on these weight-loss odysseys that require photographic evidence, I have a theory. I do NOT think the problem is not wanting to face one’s blubbery image on the screen. I do NOT think the problem is embarrassment of the throngs of curiousity-seekers who might ogle at your photo like some sort of freak in a carnival tent. No, I’m pretty confident that the Real Issue is that Before Photos are NOT a one-person job. There is another person clicking away at the camera to capture all that voluptuousness. In theory, this photographer is an encourager, someone who you trust. But the Before Photo is where theory meets reality. It’s ugly, people. In so many ways. My photographic helpers were daughters Ninja (11 year-old tomboy) and Princess (10 year-old girlie girl). Princess: Mom, you don’t look that fat. You look cute. Ninja: (collecting herself) No. You look great Mom. Ninja: (cutting her off) Let’s take the pictures, now. (clicks away at camera) Okay, turn to the side now. Ninja: Sure. Yeah, Yes…Yes… ACK! WOW! Oh Mom, I had no idea. Me: Nice. Did you get the stinking picture? Ninja: Yeah, Mom. Here’s your camera. Me: (looking at the photos) Ugh. I have my work cut out for me. Thanks for your help, girls. Princess: (peeking back around the corner) You really do look cute, Mom. Ninja: In a silly kind of way. Princess: Yes, “silly.” That’s it exactly. Me: (muttering to myself as I head away from the camera crew, who I imagine is now dissolving into a fit of giggles) I guess the whole experience could have been worse. Helpful Husband: (from the next room) What experience? So this is exactly why most people do NOT put themselves through the ordeal of those Before Photos. Strength training from hell? Bring it. They are small potatoes compared to the ordeal of the Before Photos. But I figure if you can make it through the Before Photo ordeal, then everything else is downhill from there! “A couple weeks ago. Yes. Yes. And yes.” Hard stare at HH. Long pause while HH ponders whether he would have been in more trouble if he’d been involved during the infamous photo shoot than he is for being so very unaware. Again, I say, it could have been worse! So you guessed it. My cross-training exercise of choice is: Tap Dancing. This is only mildly remarkable because I hadn’t danced in a group/team/class since high school. And I’d only even put on tap shoes a couple times in my adult life. I would have had better chances at success being a hockey player or a nuclear scientist. But I thought I’d give it a whirl since my little princess is The Dancing Queen and my darling ninja has decided to take dancing lessons to make her a Better Hockey Player. So I see this sign: Beginning Adult Tap Lessons–Try It! And I think: how hard can it be? After all, I’m an athlete, a runner. I signed up for the class, thinking it would be fun, but wouldn’t really qualify for anything mildly aerobic. Imagine my surprise when I learned that there were very few times that tap dancers actually ever stopped moving. Think of it as the equivalent of jumping rope for 45 minutes while trying to learn new ways to move your feet, remember these ways in varying patterns, have each move of your toe or heel make a particular noise at a particular moment, figure out how not to run into the other dancers in the room (all 15 years younger than you, of course) and, if possible, to do all this while not falling down on your larger-and-older-than-the-rest-of-the-group’s fanny. So maybe this actually was exercise. Yes, definitely. Way different than running. Which is, for me, essentially a solo endeavor and in which the tricky footwork consists of exactly two moves: thump, thump. And the biggest challenge consists of willing yourself to go farther or faster. So the tap dancing thing has been a welcome way for me to get that aerobic exercise without pounding on my old joints once a week. It’s given me a chance to focus my mind a different way than I’m used to, which is a welcome brain-stretch. It’s given me a chance to educate some whipper-snappers in the reality that indeed, Thriller and Bust-A-Move were, not that long ago, songs that real people danced to, not just some funky retro music. And it’s given me yet another opportunity to laugh at myself, because truly–I’m quite a sight to behold, let me tell you. And just today, another thought occurred to me. Happy Feet. Oh, yes. It makes total sense that I would love tap dancing, since I am a penguin. How does this penguin business relate to tap dancing? Of course, this runner would love tap dancing. This runner is a penguin. And in both persuits, my feet are truly happy. Late last week, I actually registered, registered, for my Very First Marathon. YIKES! I, quite frankly, am freaking out. Which explains why this is such a Big Announcement. Yes, I know I’ve said I was training for a marathon here before. But training for something doesn’t actually mean that you’re going to do it. But now, thanks to that Dotty, I’m registered. I’m definitely going. The only thing is…I’m definitely NOT ready for this. Yikes again. Truthfully, I doubt many people are fully ready for their first marathon fourteen weeks before the race. WHAT?! Only 14 weeks? I just looked that up in order to type it here and a new wave of panic has set in. Fourteen weeks?! Okay, now this is all going to be Just Fine. I am following a Very Good Training Program designed for adult-onset runners like myself to be able to complete 26.2 miles (*gulp*) on their feet and hopefully without need for medical attention. Since I’ve been in my late teens and 20’s running a marathon has been a dream of mine. Thinking of it now, if I’d spent less time in the recreational activities I selected at the U of I and more time actually pursuing this 26.2 ambition then, it would have been just a TAD bit easier. But why look back? I am certainly wiser now. And if you look at the fields of marathon/half-marathon/10k/ultra races, you’ll find that the 40-45 female age range (lovingly refered to as Master Female in lots of races; translation: old lady) usually is MORE full than the teens, 20’s and 30’s groups. Personally, I think this phenomenon occurs because this is the time of life when many women’s bodies rebel and start doing things that any normal woman wouldn’t imagine. I mean, we’d heard about all this stuff, but who paid attention? We were far too busy with the events of the day to worry about that time far, far, far off in the future when we would become a virtual hormonal time bomb. I’ve got another post planned for the lovely perimenopausal/menopausal bliss that many of us have had the privilege of encountering, so stay tuned for that sometime soon. For now, though, just know I’ve thought This Matter through carefully and determined that This Matter is exactly why the women in this age range turn to running. That being said, I’m sure that there will be many women my age and maybe even in a similar state of health (or lack thereof) who are running this marathon. That gives me some encouragement. Not enough, but some. The race is the 26.2 with Donna The National Marathon to Finish Breast Cancer, on February 21st. It’s a race with a great and important cause. I’m planning on getting some pink ribbon and running with the names of survivors and in memoria of those that died of breast cancer. I’m hoping to get lots of names and have lots of ribbons! Please send me names of anyone who you would like me to run for. I’m a rookie, but then, I’d still like to honor you or your loved one. I’m not raising money for this cause, although I might do that at some point in the future. I’m feeling enough pressure just thinking about finishing the race! Right now, I just really want to honor people who’ve gone through this disease. I’m planning on posting my progress here, for all who are interested. Thanks in advance for your encouragement. I’m really going to need it, since I’m still convincing myself that I’m an athlete. Here’s a picture of last year’s medal. Isn’t it awesome? I’m planning on wearing mine at least through my birthday. (April 4th) It’s a really Big Deal to me. Thanks for sharing the journey. Can't get enough of Go Mommy!? Enter your email address to subscribe to this blog and receive notifications of new posts by email.